This article was the second of three written by Derek Benson on the Chartist movement in Tewkesbury and Cheltenham. It was published in Bulletin 20 (2011) and was shortlisted for the county Jerrard Award. Having written an article for last year’s Bulletin on Chartist activities in the area, I thought it appropriate that a closer study should be made of the chief Tewkesbury Chartist, William Morris Moore. Moore was the son of William and Elizabeth Moore, baptised on 11 July 1813 at Hathern, Leicestershire, a village approximately three miles north-west of Loughborough. The occupation of his father is not recorded in the baptism record. Nevertheless, we know he was later a stockinger, as was William Morris Moore himself. Hathern was a centre for silk-stocking making and it was there in 1808 that John Heathcoat developed his ‘bobbinet’ machine for making lace. However, there is some mystery as to Moore’s background. In a speech that he made at Cheltenham he said that “he had been born among the higher classes, had lived among the middle classes, and was reduced to what the Tories called the vagabond class”. It is difficult to know what to make of this as at other times he refers to himself as being self-educated working class. From speeches Moore made during his Chartist activities we know that he spent some time as a youth with his parents in France and Belgium. Bennett corroborates this and tells us that he was there in 1830 during the ‘Three Glorious Days’. This was an insurrection that brought Louis-Philippe to the throne of France replacing Charles X. It followed three days of fighting (27-29 July 1830) and inaugurated a liberal constitutional monarchy known as the ‘July Monarchy’. Perhaps this event taught the seventeen-year-old Moore that the people could change their government by direct action. Bennett certainly thought so and wrote that “the fevered notions of ‘liberty and equality,’ which he had imbibed in France, during those ‘Three Glorious Days’, sowed in his mind the seeds of the revolutionary principles of Chartism”. Bennett also tells us that Moore received religious instruction from an early age from Wesleyan Methodist relatives “by whom he was brought up”. It is, of course, conjecture, but perhaps Moore’s parents were in service, hence the ‘born among the higher classes’ statement? Perhaps his parents travelled abroad with their employer leaving him with relatives and he subsequently rejoined them when he was older? It is not clear when Moore first lived in Tewkesbury. 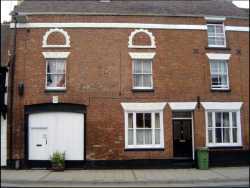 However, he was certainly there by 1839, living in Jeynes Row. Prior to this, we know that he worked as a commercial traveller and journeyman stocking-maker. According to census returns his father was born in Tewkesbury. We know that a successful Chartist meeting was held in Tewkesbury on 12 March 1839 when a leading Chartist, Henry Vincent, spoke. At this meeting it is highly probable that Moore was elected secretary of the newly formed Tewkesbury Working Men’s Association. 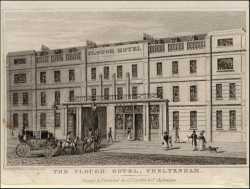 The first report of Moore speaking as secretary was when he addressed about 2,000 people at the uninhabited York Hotel in Cheltenham on 3 June 1839. Several Cheltenham Chartists spoke, as did the future leader of the ‘Newport Rising’, John Frost, who addressed the meeting at considerable length. At the start of his speech, Moore introduced himself as a 'stranger', indicating that this was his first public appearance in Cheltenham. During this speech he referred to his time on the Continent, favourably contrasting the English work ethic and drinking habits with those of the French. He used this to contradict notions that working people should not have the vote because they were ignorant, drunken and idle. He exhorted his audience “never give our enemies cause to say ‘there goes a drunken Chartist’”. It is likely that William Morris Moore was teetotal as he was for some time a member of the Tewkesbury Tee-total Society. He concluded his speech by telling his listeners not to expect help from the middle classes and that “was it not time for us to bestir ourselves?” He resumed his seat amidst great cheering. Surprisingly, after Frost had spoken, ‘three groans’ were proposed and carried for the Cheltenham Free Press, alias ‘The Twaddler’. This was because of some mild criticism of the Chartists that had appeared in that newspaper. The groans were given, immediately followed by three groans for the newspaper’s publisher, Samuel Harper. Yet the radical Free Press was the only organ that gave full coverage to local Chartist activities and was on the whole supportive. This is indicative of the siege-mentality of the Chartists. Their ‘groans’ would perhaps have been better employed on a correspondent of the Liberal-leaning Gloucester Journal, whose report of a meeting on the bowling green of the Golden Hart Inn in Stroud, published on 16 March 1839, illustrates the vituperation that the Chartists engendered. The chief speakers were the Chartist leaders, Henry Vincent and William Burns. On Saturday evening last was exhibited the most contemptible mountebank scene that ever disgraced the town of Stroud … Burns’s appearance was suitable to his purpose, he looked like a sturdy determined butcher … Vincent, the hungry state tinker – the paid mountebank demonstrator – slunk forward like a cunning, ferocious, scalping savage, or rather like a beast of prey thirsting for blood. – The institutions which he could not overturn, he covered with filth, and polluted with venom the principles which he could not destroy … The people stared with wonder, as they would at a learned fortune-telling pig … A more vicious, impudent, monstrous attempt to delude the people, and to hurry them on to self-destruction, never suggested itself to the most fiend-like brain. This was, no doubt, Eliza Hale of Tewkesbury, secretary of the Tewkesbury Female Radical Association. She was active in the local Chartist movement and chaired a meeting in July of 500 women in Cheltenham that was addressed by Henry Vincent. Although the Chartists did not directly campaign for female suffrage many women attended meetings, sometimes forming the majority in the crowds. Eliza Hale had a letter published in the 3 August 1839 edition of the Chartist newspaper the Northern Star; it accompanied a longer letter that Moore wrote on 23 July 1839. He used some sarcasm in describing Tewkesbury as “an ‘ancient and loyal borough’ as the town are pleased to call it … No doubt the Tories and Whigs think that the inhabitants of this ‘borough’ have sufficient to make them ‘loyal’ … ” He went on to describe the low wages and living conditions of Tewkesbury’s stocking-makers: “with this state of things the working portions of this ‘ancient and loyal borough’ have at length become very dissatisfied … many of them have become Chartists”. On 12 August 1839, along with others, Moore addressed a meeting of about 1,000 at Winchcombe. Some 550 people had marched from Cheltenham with banners proclaiming their interest in several issues: 'The Voice of the People', 'Cheltenham Female Democratic Association', 'Liberty of the Press', 'No Military Flogging', 'No Impressment', 'Radical Reform and Liberty of Conscience'. This is indicative of Chartism being a movement not confined solely to the Charter. They were met by Winchcombe Chartists with a banner inscribed 'Welcome'. 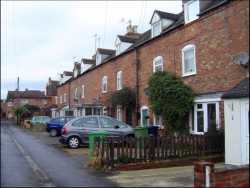 They all marched through the town to a field at nearby Gretton, owned by John Capel. The meeting commenced with a song The Triumph of Freedom. At this point the local parson, Rev. Harvey, appeared on horseback and warned the chairman of the meeting, Mr. Banfield jnr., that he would be held responsible for any sedition spoken there. Moore answered, hoping that he would lay any blame on him if sedition was spoken and invited Harvey to stay and listen – he declined. Along with Moore, another man from Tewkesbury, reportedly named Bease (perhaps Samuel Pearse) spoke, addressing his audience as “brother slaves”. Moore concluded his speech with the words “Agitate –Agitate – Agitate, and I will never cease doing so till the Charter is the law of the land.” This meeting was criticised in the Cheltenham Chronicle as being a meeting of “motley and dissolute groups … the usual violent addresses were delivered”. In response 'A friend To Fair Play' wrote to the Cheltenham Free Press saying that “The speech of that worthy young man Mr Moore, of Tewkesbury, inculcated better Christianity and morality than many of the clergymen of the Established Church preach, whose humble slave the Editor of the Chronicle is.” (A reference to the influence of Cheltenham’s Rev. Francis Close.) At about this time it is reported that William Morris Moore had taken out a ‘Licence to Preach’ as a Methodist. This was an official authorisation for a person to preach the Gospel. It was not unusual for religious non-conformists (particularly Methodists) to support Chartism: Congregational Minister Ben Parsons at Ebley, near Stroud, spoke in favour of the Charter; the militant national Chartist leader Joseph Rayner Stephens was a Methodist Minister (at one time in Cheltenham). Also in Cheltenham for a period was the Charter-supporting Unitarian Minister Henry Solly. Four days after the Winchcombe meeting Chartists carried out a ‘sit-in’ at St. Mary’s Church Cheltenham. After this action a crowd of around 2,000 heard Moore speak in a field in London Road. He took his text from Jeremiah 1:17–19 comparing the English people with the plight of the Israelites: “it was always the case that the afflictions that were brought upon them, were from sins committed by their kings or priests, and never for sins committed by the common people”. He carefully added that no person should go away with the impression that in speaking against kings he was speaking against the sovereign of this country as “he would not say anything seditious”. He went on to criticise the Rural Constabulary Act that proposed the setting up of county police-forces, likening it to the “French spy system”. He attacked both Tories and Whigs, the Poor Law, and described the Corn Laws as “damnable”. He asked The Almighty “to open the eyes of the rulers of the land, to the danger of anarchy and convulsion which threatened them if they did not administer justice to the poor, and remove the misery and suffering of the people”. He concluded his speech by urging his listeners “to obey the laws of the land, while they are the laws, but to examine them publicly and express their opinion of them”: (characteristic of him to discourage law-breaking). The hymn Praise God From Whom All Blessings Flow was sung and the crowd quietly dispersed. The sermon that Moore preached at London Road appears to have prompted Rev. Francis Close to make derogatory comments concerning its content and the character of the preacher. Moore answered in a letter published in the Cheltenham Free Press on 7 September 1839. Rev. Sir, – I understand that in the course of a discussion which took place between you and Mr. William Milsom a few days ago you had the monstrous audacity to say that I preached blasphemy in my sermon on the London-road, that I was a drunken, idle, and dissolute fellow, and that I was turned out of the Tewkesbury Tee-total Society for my habits of drunkenness … I now demand of you a proof of the truth of these different charges … though I am comparatively illiterate, am a member of the Working classes, and have not the facilities of obtaining knowledge which you have, yet, if you like, I will meet you on the platform of any public meeting you may think proper to call for the purpose, and I will there prove the rationality and Biblical character of those principles, and you, if you can, shall disprove the same. I have the honor [sic] to be, very Rev. Sir, your Fellow-citizen. Another repercussion of the Chartists’ action that weekend was that on the following Monday, John Haines, a framework knitter of Tewkesbury, appeared before the Cheltenham Magistrates. He had attended the St. Mary’s protest and handed out hymn sheets at the London Road sermon. He was charged with insulting a Col. Smith and another gentleman, obstructing the High Street by preaching a sermon, and being drunk. “Are you in the habit of preaching Sir?” asked one of the magistrates. “Preaching, Sir, did you say; I don’t preach generally; I am not in the habit of preaching, except on elevated occasions, when I get a little drop too much, which was the case on the present occasion.” Fined 5s. [25p] with costs. Moore no doubt spoke regularly in Tewkesbury, but the only full report we have of a sermon there was one given on 4 September 1839 at The Oldbury. His text was taken from Genesis 9:1-3 whereby he contrasted God’s promise of the food of the earth for man, with the monopoly of such bounty by the rich and powerful. He went on to say (apparently sincerely) that Queen Victoria “knew nothing of the misery now prevailing in England” and blamed her ministers. The correspondent noted that “Upon the whole it was the most interesting meeting of the kind ever held in this town”. On the afternoon of Sunday 8 September 1839 William Morris Moore preached to a large crowd opposite the Old Abbey Field in Winchcombe. He took his text from Proverbs 31:9 “Open thy mouth, judge righteously, plead the cause of the poor and needy”. He described the wretchedness prevalent in England, blaming it on bad legislation. He stated that it was the duty of kings, queens, rulers and religious ministers to obey the injunction of his text, and denounced in strong terms all those who refused to do so. 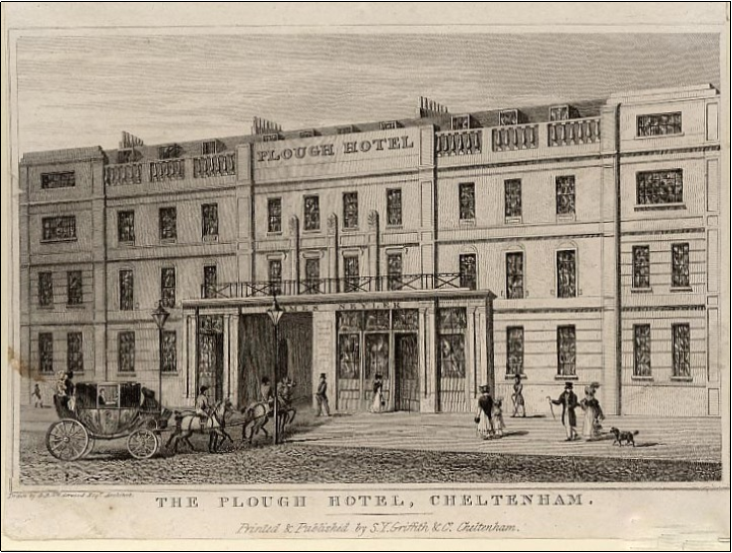 It had been announced that, on the next day, the Chartist leaders, Feargus O’Connor and John Frost, would attend a public meeting in Cheltenham. Alarmed local magistrates appointed seventy special constables and arranged for the military (in the form of a detachment of the 12th Lancers from Stroud and the 1st Troop of the Yeomanry from Gloucester) to proceed to nearby Shurdington and await orders. Policemen were sent to inspect the venue of the meeting: a field where the new Union Workhouse was to be built (now St. Paul’s Medical Centre). They reported back with the intelligence that “there were two men beating a carpet, about twenty children, and as many nursemaids”. This information must have alarmed the magistrates even more as they then ordered the troops to proceed to the Plough Hotel in Cheltenham. In the event, O’Connor and Frost could not attend due to pressing business in London. The meeting went ahead chaired by the local radical, William Penn Gaskell (descendant of William Penn, founder of Pennsylvania), who spoke at some length. Other local Chartists, such as William Spackman, John Goding, John Glenister, Milner and Williams, addressed the meeting. When William Morris Moore rose to speak he was greeted with “tremendous cheering” by the 3,000 strong crowd. He ridiculed the bills posted throughout the town that cautioned the people not to attend the meeting and wondered why special constables were necessary to hear “such a great long-legged giant as myself! Oh Dear! Oh Dear!” He attributed the lack of rights for working people to two main causes. Firstly, dissension among the working classes in that many of them supported the Whigs or Tories instead of supporting their own party. Secondly, the Clergy of all denominations who told them that, to be involved in politics, was to lose their religion. He thought this inconsistent, in that by saying this, they themselves were mixing religion with politics. Not everyone agreed as there was some throwing of apples and stones. The meeting ended with the singing of The Trumpet of Liberty, three cheers for the Convention, three cheers for incarcerated friends and six groans for the magistrates. The meeting quietly dispersed with some of the Chartists marching three-abreast up the High Street. The soldiers remained in the yard of the Plough Hotel. On the following Sunday, Moore delivered a sermon to 2,000 people at the Market Place, Cirencester. As in his sermon after the St. Mary’s sit-in, he took his text from Jeremiah 1:17–19 and denounced ‘the great’ as a principal cause of the miseries of the poor and particularly attacked the Poor Law. He announced that he would speak again that afternoon and up to 5,000 assembled to hear him. However, the chiming of church bells drowned out his voice and they adjourned to London Road where Moore spoke for an hour and a half, “listened to throughout with deep attention”. He arranged another public meeting there for the following day, which commenced at 6.30 pm in heavy rain. Some working men in the audience disrupted the meeting and fighting broke out. After a short adjournment to the local Working Men’s Association rooms the open-air meeting recommenced with Moore preaching a sermon without further disturbance. No doubt, as a precaution, the public houses were ordered to be closed at 10 o’clock. An indication of problems with Moore’s health becomes apparent when he cancelled a sermon planned for 21 September at Leckhampton due to a “severe indisposition”. He instead managed to speak for a short time at Green Lane, Charlton, to a small audience taking Isaiah 42:22–23 as his text: “But this is a people robbed and spoiled, they are all of them snared in holes, and they are hid in prison houses”. On 29 September 1839 William Morris Moore was back in Winchcombe addressing a large crowd. He began by warning the people that he had heard that attempts would be made to disrupt the meeting. He stated that his Licence to Preach gave him as much legal authority to preach “as your parish parson has for preaching in the pulpit of your parish church”. He cautioned would-be hecklers that he would report them to the magistrates! In the event he was not interrupted. He then proceeded to take as his text Isaiah 10:1–2 “Woe unto them that decree unrighteous decrees … turn aside the needy from judgement … take away the right from the poor”.He, of course, drew parallels with their present rulers. He even went as far as saying that all those in authority, “kings, queens, princes, lords, dukes, legislators and administrators, but especially Christian ministers [who refuse to give justice to the poor] I point them all, without exception, I say, I point them all to hell as their future destiny”. For good measure he also attacked the philosophy of Malthus. The last report that we have of Moore preaching is on Sunday 6 October 1839 at Whitfield’s Tump on Minchinhampton Common. The audience numbered around 4,000 – of whom about one half were women. He spoke for an hour and a half and his oratory was described as “one of his most violent and inflammatory addresses under the cloak of a sermon”. His text was from Jeremiah 5:29 “Shall I not visit for these things? Saith the Lord: shall not my soul be avenged on such a nation as this?” At the conclusion of the meeting twelve small wooden boxes were carried to collect money for the support of the families of 'incarcerated Chartists'. This was probably in aid of three Chartists from Wotton-under-Edge: Henry Lacey, Joseph Witts and Henry Ratcliffe, arrested in August on charges of conspiracy and sedition. The sum of £3.16s [£3.80p] was collected. At this meeting Moore intimated that he would pay another visit to the neighbourhood. But he did not; the last reported event that he attended was a Cheltenham Chartist tea-party later in the month. 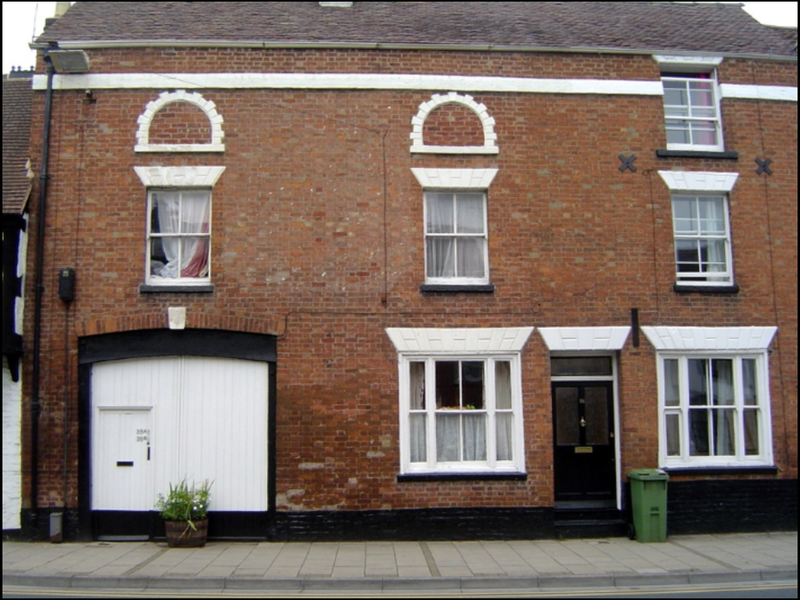 Moore left Tewkesbury by late November 1839 and was next heard of in Tewkesbury Workhouse in 1841 where he died of consumption on 21 July. My previous article discussed these events and the published deathbed recantation of his Chartist activities. I do not intend to rehash that here but would add a little concerning his relationship with his father who supposedly confirmed the authenticity of his son’s ‘confession’. Francis Hayes, a fellow Chartist who knew Moore personally, had written that Moore had told him of “the injustice of the father to his children, by departing from the role of morality! (nay, I had almost said, inculcating unnatural precepts)”. This picture of William Moore snr. is reinforced by the fact that he was sentenced in February 1840 to one month’s hard-labour in Tewkesbury Gaol for “being a rogue and vagabond, in running away and leaving his wife and family chargeable to the parish of Tewkesbury”. William Morris Moore was only active as a Chartist (at least in Gloucestershire) for a few months in 1839. This was a critical year for the movement throughout Britain with Gloucestershire making significant, non-violent, law-abiding, contributions to the agitation. Moore certainly crammed in a great deal of activity during this period. From reports of his sermons and speeches, along with other commentaries and letters, we see him starting as confident, humorous and balanced. In his later orations he seems to become more strident and somewhat paranoid. Perhaps the accumulating effects of his illness, poverty, attacks on his character, attacks on the movement, and particularly the debacle of Newport in November, led to a breakdown and his disappearance from the scene. His final days in the Tewkesbury Workhouse were those of a terminally ill, god-fearing man, who perhaps thought (and was no doubt told) that God was not a Chartist and that his soul was in peril. His deathbed recantation (if authentic) should be viewed in that light. William Morris Moore often quoted from Jeremiah 1:17–19 which contains the words “be not dismayed at their faces, lest I confound thee before them”. As he languished in Tewkesbury’s ‘Bastille’, dismayed and confounded he very likely was. The magistrates of the Borough have had information that the chartists in the Town & neighbourhood are very numerous, and are actively engaged in organising themselves, and it is believed are generally arming. The respectable inhabitants are consequently much alarmed, the Town and district being in a very unprepared state for meeting a sudden outbreak, as there are no troops within many miles, and no Yeomanry enrolled in this part of the county. Under these circumstances, I am instructed by the magistrates assembled at a meeting held this day to aquaint your Lordship with our situation, are to request that a detachment of Military may be stationed in this Town or its vicinity for its protection. Your Lordship is doubtless aware that the population here is almost entirely of the operative class, so that a constabulary force to be depended upon cannot be so conveniently organised as in many other places – nevertheless there are three Banks in the Town (mainly supported by the agricultural Interest in the neighbourhood) in which much property is at stake. It may be right I should add that situated as we are on the high road from Birmingham to Bristol our operatives are in constant communication with travelling emissaries from the former place. Your Lordship may probably have heard that there was an outbreak here in October 1831 which was only quelled by the 14th Dragoons then stationed at Gloucester, and the recollection of the determined character of the mob on that occasion and the necessity which existed for calling in the military, would it is feared have a paralysing effect upon an unsupported constabulary force in case of another disturbance. There are also at this time large bodies of railway Labourers at work in the immediate neighbourhood whose presence is an increasing source of alarm to the well disposed. Your Lordship’s very obedient servt. I am directed by the Magistrates of this Borough to transmit to your Lordship the copy of a letter addressed by their direction to the Secretary of State, and of the reply received thereto, in order that your Lordship may be made acquainted with the present state of the Borough. Great anxiety is felt some measures should be adopted for the protection of the Town, especially as it is generally understood, that large numbers of the operatives will not work after the 12th August the Magistrates direct me to express to your Lordship their hope, that in any arrangements that may be thought necessary to be made for the defence of the County generally, this District may receive your Lordships particular attention. It has been suggested that a Troop of Volunteer Infantry might be easily raised here. Would your Lordship be so obliging as to state, whether, if such a Troop were raised, arrangements could be made for their being properly trained and whether any and what arms would be granted by Government. The Upton Troop of Worcestershire Yeomanry Cavalry have recently been on duty at Birmingham. They are now returned having been replaced by the Evesham Troop. It has been suggested that your Lordship might probably be able to procure an order to be issued for their holding themselves in readiness to march to this Borough in case of a disturbance; and the Magistrates direct me to make known this suggestion known to your Lordship. 1 Derek Benson, ‘Chartism in Tewkesbury and District’, THS Bulletin 19, 2010. 2 Leicestershire Record Office, Hathern parish register DE731/3. 3 Bennett, Tewkesbury Yearly Register & Magazine for 1841. James Bennett (1785-1856) bookseller, Freeman and historian of Tewkesbury. 4 Gloucester Journal 16 Mar 1839. 5 Cheltenham Free Press 8 Jun 1839. 6 mountebank = quack doctor; market-place entertainer; charlatan. 7 Woodard Database, Linnell: Tewkesbury Pubs. 8 Cheltenham Free Press 17 Aug 1839; Cheltenham Examiner 14 Aug 1839. 9 Cheltenham Free Press 24 Aug 1839. 10 Rev. Francis Close (1797-1882), later Dean Close of Carlisle (Dean Close School, Cheltenham is named after him). 11 Cheltenham Free Press 24 Aug 1839; D. Benson, ‘Chartism in Tewkesbury and District’, THS Bulletin 19, 2010. 12 William Milsom of Cheltenham, National Chartist Association Branch Secretary. 13 Gloucester Chronicle 24 Aug 1839. 14-15 Cheltenham Free Press 14 Sep 1839. 16 Northern Star 21 Sep 1839; Cheltenham Free Press 14 Sep 1839; The Charter 22 Sep 1839. 17 Cheltenham Free Press 21 Sep 1839. 18 Cheltenham Free Press 28 Sep 1839; Cheltenham Examiner 25 Sep 1839. 19 Cheltenham Free Press 5 Oct 1839. 20 Rev. Thomas Malthus believed that society could not improve indefinitely, as by God’s design, sooner or later, population gets checked by famine, disease and widespread mortality. 21 The Charter 20 Oct 1839; Gloucestershire Chronicle 12 Oct 1839. 22 Northern Star 26 Oct 1839. 23 Gloucestershire Archives, TBR A13/1; Cheltenham Examiner 12 Feb 1840. 24 ‘Bastille’ was the sobriquet given to the ‘Houses of Industry’ after their introduction via the Poor Law Act of 1834.